Pemphigus Vulgaris - Pictures, Treatment, Definition, Symptoms. 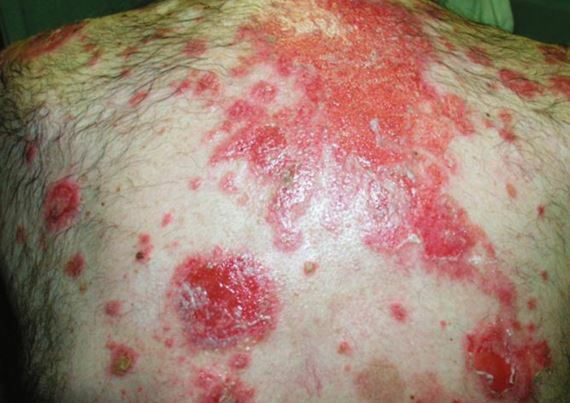 Pemphigus vulgaris is a dermatological problem, specifically an autoimmune blistering disease. It is commonly manifested by the appearance of blisters of different sizes on skin and mucous membranes. It came from the Greek words pemphix meaning bubble and vulgus which means common. This disease is chronic, progressive and often fatal. This dermatologic problem has a high incidence rate in Jews or Mediterranean race. It usually happens in men and women in middle age and old age. It is an autoimmune disorder, which is usually inherited among high risk races. Looked like irregularly shaped erosions inside the mouth’s mucosal membrane. 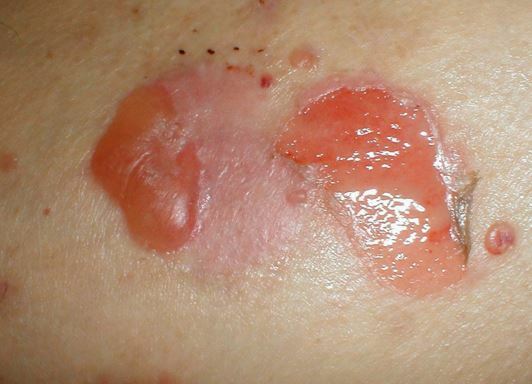 The skin blisters increase in size, burst and leave large, painful eroded regions with crusting and discharges. In the long run, large areas of the body will be involved therefore there’s a high chance for bacterial super infection. Consequently, patients will be vulnerable to secondary bacterial infection. 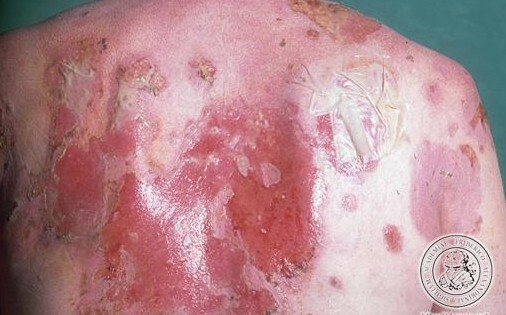 The bacteria on the skin will have moderately effortless admission to the blisters as they ooze, rupture, and leave denuded areas exposed to the surroundings. It is concluded that the most frequent complications begin as soon as the infection process is extensive. The result will be fluid and electrolyte imbalances, this is due to the loss of fluid and protein as the blister bursts. When the disease process reaches its extensive stage which includes areas of the body skin surface and mucous membranes hypoalbuminemia or a low albumin level in the blood can happen. This disease originated from immunological mediated reactions. Therefore, this is an autoimmune skin disease concerning immunoglobulin G (IgG). The pemphigus antibody is directed in opposition to a specific cell-surface antigen in epidermal cells. This autoimmune reaction formed the blisters. Age is also a factor. Individuals who are 50 years old to 60 years old are mostly affected. The onset of the disease also happens during these years. It can also occur in children or older people. Infants can also have what they called neonatal pemphigus, in which they have maternal auto-antibodies passed to them through placental circulation that attack the epidermal cells. The condition may be associated with medicines like penicillins and captopril. Severe allergic reactions to these medications can result in abnormal blisters in the skin. Patients with other autoimmune diseases like myasthenia gravis and thymoma can also be predisposed to have this skin disease. To diagnose this disease the patient will need to undergo a histologic examination of a biopsy specimen. This laboratory work is usually done by a dermatopathologist. The patient’s serum from the blister and the surrounding skin will be tested for antibodies with the help of Immunofluorescent studies. This involves the examination of the serum under immunofluorescent light to determine the specific antibodies present. The illustrations below depict pemphigus vulgaris at different sites in the body and different stages of disease. There are some cases wherein corticosteroid treatment has severe toxic effects because the high dosage level is maintained until remission is evident. The following can be given to aid in controlling the ailment and decrease the dose of the corticosteroid. Immunosuppressive drugs are given to reduce the number of circulating abnormal antibodies in the blood. Because of immunosuppression, the patient should be placed in reverse isolation status to prevent other infections. Furthermore, plasmaparesis momentarily reduces the serum antibody level and has been utilized with unpredictable accomplishment, even though it is normally set aside for critical cases. 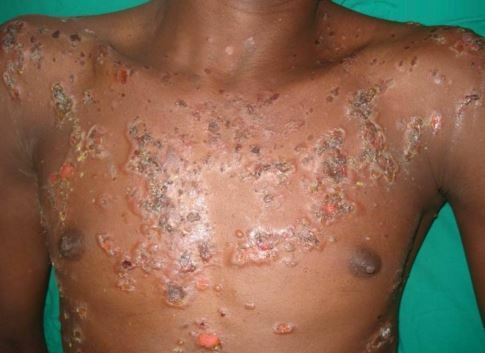 Plasmaparesis involves the filtering of the blood to remove the antibodies causing the autoimmune reaction. To encourage renewal of epithelial tissue. Before the arrival of Corticosteroids, most of the patients with this problem died. The treatment with Corticosteroids has diminished the mortality rate to 5-15%. Pemphigus vulgaris if not treated is often fatal due to the reason that the patients are most often than not are susceptible to infections and fluid and electrolyte imbalances. During the first few years of disease most deaths take place. The prognosis is good if the patient survives 5 years. During the early stage the disease is easier to control rather than if the disease is already widespread. The probability of a higher mortality rate increases if the therapy is delayed. The prognosis is worse in older patients and in patients with widespread disease. Morbidity and mortality are directly proportional to the extent of disease, the maximum dose of Corticosteroid required to stimulate remission, and the existence of other illnesses. The outlook is generally enhanced in childhood than in adulthood. There are also reports that a small number of uncommon cases of pemphigus vulgaris are changing to pemphigus foliaceus. In conclusion, experts say that the seriousness and usual records of pemphigus vulgaris are unpredictable. Super infections. The open blisters may attract other opportunistic microorganisms such as fungi, bacteria and virus. Scarring. When the lesions are treated, it usually leads to cosmetic alterations in the skin.